Compare with last year ,Egood movable partition wall company has recorded considerable growth in turnover. It mainly attributable to Egood always keep improving of our product’s quality, it helps us become more confidence when we sell also won trust of the clients. Most people can’t help to ask how can you prove your excellent quality?Verbal statements are no guarantee, next we will show you ten core advantages of Egood movable partition in detail , maybe you can find some answer of your question after you read this article. 1.Egood latest 2014 carrier Dupont POM materials to meet its best wearing resistant,the high carbon chromium bearing steel has reach to a strength 10.9 grade. 2.Egood patent,vertical crank handle shaft,made by 304 stainless steel ,thick materials. 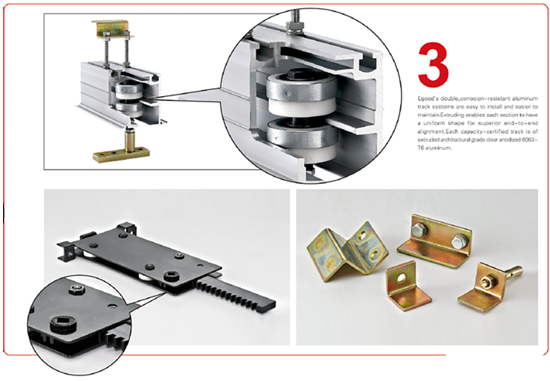 3.Egood double corrosion-resistant aluminum track systems are easy to install and easier to maintain.Extruding enable each section to have a uniform for superior end-to-end alignment. Each capacity-certified track is of extrude architectural grade clear anodized 6063-T6 aluminum. 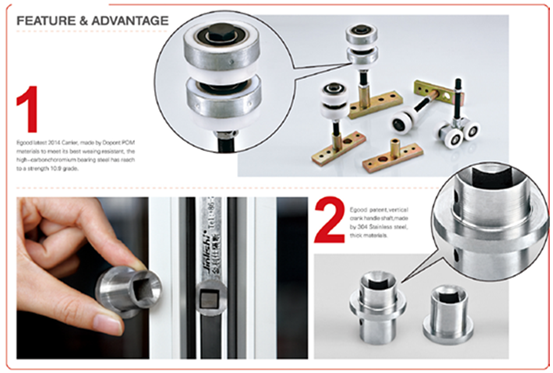 4.Egood’s patent,304 stainless steel LCP panel crank handle shaft cup and operable handle. 5.The safety and stability of movable partition are effected by what kind of keel materials used inside in structure. 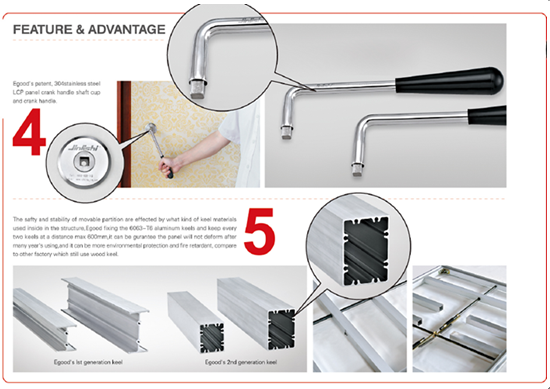 Egood fixing the 6063-T6 aluminum keels and keeps every two keels at a distance max no more than 600mm,it can be guarantee the panel stable after many years using.It also can be environmental protection and fire retardant, most of partition manufacturer in domestic which still use wood keel. 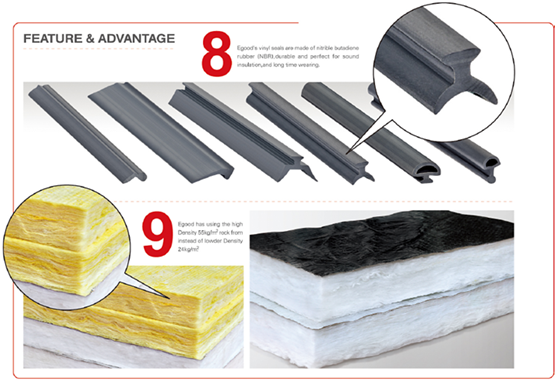 6.To seal the corner, Egood gets its own design about specially developed conically shaped corner pieces that fit closely together.They ensure excellent soundproofing and stability. 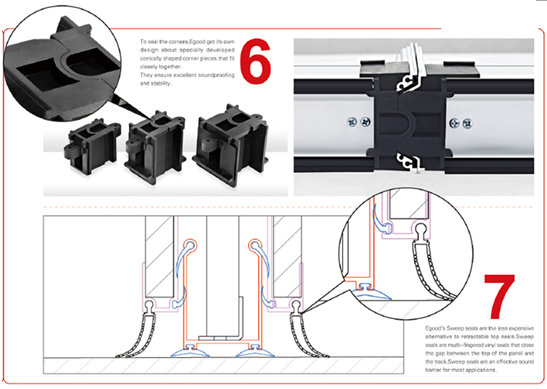 7.Egood’s sweep seal are less expensive alternative to retract top seals. Sweep seal are multi-fingered vinyl seals that close the gap between the top of the panel and tracks.It really is an effective sound barrier for most applicant. 8.Egood’s vinyl seals are made of Nitrile Butadiene Rubber(NBR),durable and perfect for sound installation,and long time wearing. 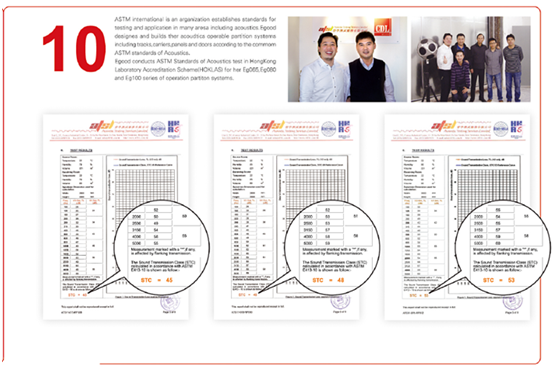 10.ASTM international is an organize establish standards for testing and application in many areas including acoustics. Egood designs and builds their acoustic operable partition systems including tracks,carriers,panels and doors according to the common ASTM standards of acoustic. Egood conducts ASTM standards of acoustic test in HongKong laboratory Accreditation Scheme(HOKLAS) for her Ego 65, Ego80 and Egood 100 series of operation partition systems.Nowadays,our type 65 can reach STC 45,type 80 can reach STC 48, type 100 can reach STC 53. Ten advantages make sure the excellent quality of our partition ,it shows Egood really concern about each detail of our product.We always pursuit“customer first service foremost”.Your great satisfaction, our endless motivation.